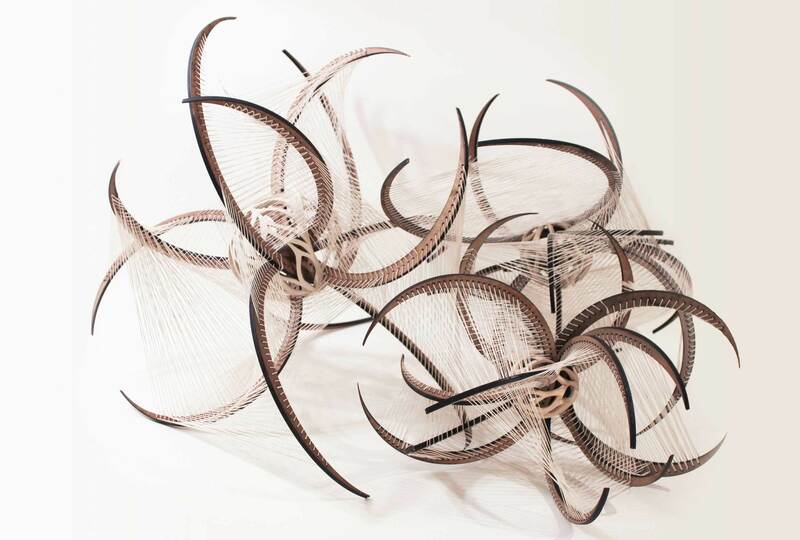 SALEM, MA – The Peabody Essex Museum (PEM) presents an exhibition that explores how engineering and design concepts from nature can make the world a better place. Opening May 26, Wild Designs features not only bio-inspired works by artists, but also 24 projects and prototypes conceived by innovators who look to nature and living systems for new ideas and creative solutions to human problems. The exhibition takes place in PEM’s Dotty Brown Art & Nature Center and explores biomimetic and bio-informed innovations in design and technology that either model or engage nature to generate novel products and more sustainable solutions. Included are design projects ranging from preliminary concepts to realized products and buildings, as well as mixed media sculptures, artist installations and drawings. Some of the featured designs will be as familiar as the hook and loop fastener, created in 1941 by Swiss engineer George de Mestral, who went for a walk in the woods and wondered if the burrs that clung to his socks — and his dog — could be turned into something useful. An air purifier made from a living plant inspired by early research from NASA turns nature into practicality as does a backpack designed to mimic the sliding scales of a pangolin. 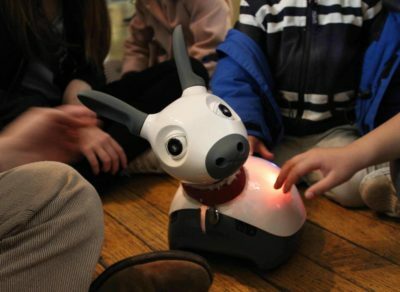 MiRo, a personal companion robot that resembles a small dog, includes smart sensors based on 20 years of research on animal brains and behaviors by UK scientists. Other featured projects aid with energy conservation, personal gear design, agriculture and water collection. One exhibition area features Geckskin, a super adhesive based on the toe pads of geckos created by researchers at UMass Amherst. This inspired material allows for an index card-sized piece to hold around 700 pounds without leaving behind a sticky residue. Scaling a building, like Spiderman, by wearing a pair of gecko-tape gloves may not be too far off. The Warka Water Tower mimics the behavior of a namibian desert beetle by harvesting moisture directly from the air. The water is collected so that people living in remote places don’t have to walk miles to fulfill a basic need for water. Meanwhile, the very idea of a house is upended with the Fab Tree Hab, a design solution created by a team formerly at MIT who came up with the idea to grow homes from native trees. The structures are designed to also be edible, for their human inhabitants and for the wild creatures outside. In Milan, a studio led by Italian architect Stefano Boeri came up with the concept of Bosco Verticale, or Vertical Forest, as a way to combine high-density residential development with tree planting in city centers. Two residential towers, measuring 364 and 250 feet high, host 800 trees, 4,500 shrubs and 15,000 plants. Rather than exploring a particular product angle, works by the six featured artists respond to nature or pose questions, such as Emily Longbrake’s exploration into the principles behind repeating patterns in nature, like fish scales and bird feathers. Her featured sculpture Origin/Insertion investigates a skeletal structure in an animal with a particularly long spine. Interactive spaces include a structure built along the museum’s Axelrod walkway, led by Sam Batchelor of Boston’s DesignLAB Architects who will work with a graduate class from Mass College of Art and Design in a seven-week workshop to create a site specific bio-inspired structure that will open in mid-August. Visitors will also find an interactive zone called Nature’s Design Lab, a “hands-on, minds-on” participatory space for visitors to explore nature’s genius. The Lab will integrate natural history objects, close observations of nature, design-making, games and activities to illustrate and illuminate what nature can teach us about invention. Jube, 2015, a bioinspired live edible insect trap, modeled after pitcher plants. Biomimicry Global Design Challenge entry by Pat Pataranutaporn with Ratchaphak Tantisanghirun, Purichaya Kuptajit, Tavita Kulsupakarn, Alfredo Raphael. Image courtesy of BioX team. Sebastian Conran with Tony Prescott and Ben Mitchinson, Consequential Robotics, United Kingdom, MiRo, 2017, mixed media. Courtesy of Consequential Robotics. 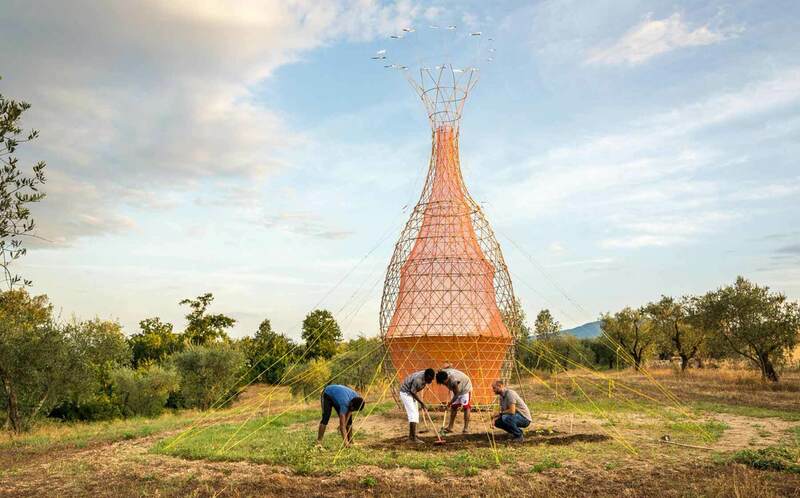 Arturo Vittori and Warka Water, Italy, Warka Water Tower, Bomarzo, Italy, 2017, bamboo, hemp, and plastic. Courtesy of Warka Water. Emily Longbrake, Origin/Insertion I, II & III, 2017, ceramic, plywood, and cotton thread. Courtesy of the artist. Over the last 20 years, the Peabody Essex Museum (PEM) has distinguished itself as one of the fastest-growing art museums in North America. Founded in 1799, it is also the country’s oldest continuously operating museum. At its heart is a mission to enrich and transform people's lives by broadening their perspectives, attitudes and knowledge of themselves and the wider world. PEM celebrates outstanding artistic and cultural creativity through exhibitions, programming and special events that emphasize cross-cultural connections, integrate past and present and underscore the vital importance of creative expression. The museum's collection is among the finest of its kind boasting superlative works from around the globe and across time — including American art and architecture, Asian export art, photography, maritime art and history, Native American, Oceanic, and African art, as well as one of the nation’s most important museum-based collections of rare books and manuscripts. PEM's campus affords a varied and unique visitor experience with hands-on creativity zones, interactive opportunities and performance spaces. Twenty-two noted historic structures grace PEM’s campus, including Yin Yu Tang, a 200-year-old Chinese house that is the only such example of Chinese domestic architecture on display in the United States. HOURS: Open Tuesday-Sunday, 10 am-5 pm. Closed Mondays, Thanksgiving, Christmas and New Year's Day. ADMISSION: Adults $20; seniors $18; students $12. Additional admission to Yin Yu Tang: $6 (plus museum admission). Members, youth 16 and under and residents of Salem enjoy free general admission and free admission to Yin Yu Tang. INFO: Call 866-745-1876 or visit pem.org.